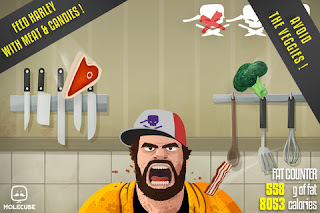 Epic Meal Time is a series of cooking vlogs available on Youtube, where the cooks are more concerned with using the greasiest ingredients available than teaching you how to cook. In a society so worried about weight, obesity and the nutritional value of food, the attitude is somewhat refreshing. That same attitude of never taking themselves seriously permeates the iOS app; thus, the game will profit more to fans of the show, as the diverse items, clothing, and challenges are based around the show's recipes and particular humour. The gameplay is similar to Fruit Ninja's, where you slash at the screen to move along pieces of food. The screenshot summarizes pretty well the cimple concept; but when playing, it can get surprisingly involving and complex. The sessions are generally short and can get repetitive, but the different upgrades and achievements will keep you playing nonetheless. The app isn't expensive and is currently on sale at 1$, so give it a try for a lark or if you like the show.